We are so happy that Shiloh has found a lasting home. 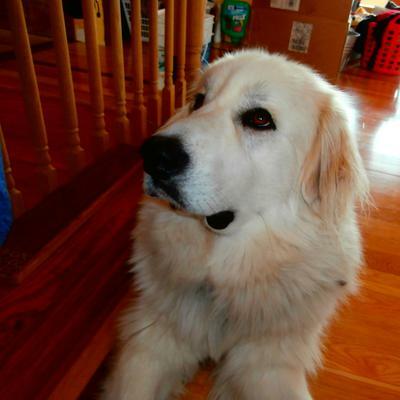 We thought Shiloh had gone to his forever home but, unfortunately, it didn’t work out. Contrary to what some think, Pyrs do need exercise in order to keep them socialized, their minds sharp with seeing and smelling different things, and just like us, it keeps them healthy and fit. This lovely boy is 5-years old, he’s good with children, cats and other dogs. Like every Pyr, he does bark to warn and to properly patrol his fully-fenced property (minimum 6 foot fence is required). He needs regular grooming to keep his coat matt-free, and nails trimmed. He can be shown where he is allowed to have his piece of garden in which to dig. Like a Pyr, he needs to be leashed whenever outside a fenced area since they are independent thinkers. Please do your research on this breed to find out if this is the breed for you. We have a lot of information on our website. 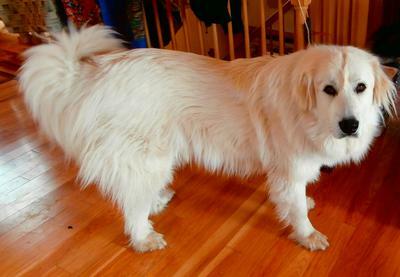 I have already experienced living with a Pyr and loved it. I worry though that Shiloh has had several homes and might have some behaviour issues due to this fact. Is he good with children, other dogs, does he like to walk. It would be awful for this poor dog to be placed in another home only to find that someone hasn't been entirely honest about him and then he has to be moved again. Thank you for supplying any history you can.